On September 2nd 2014 we visited Karyes to get an extension of our Diamoniterion: we asked for one day extra and 10 minuts later we got four extra days, what a service! The renovation activities on the interior of the Protaton did finish not long ago, but on the outside work is still in progress. The badly damaged frescoe’s on the outer wall of the church were covered with protection material. Outside the apsis workmen were busy digging a trench and drilling holes, maybe to improve the fundaments? To my surprize I did not see any sign of archeological survey, because I can imagine that maybe something interesting might show up, digging in such historical ground? This entry was posted in Karyes and tagged Protaton, restauration. Bookmark the permalink. 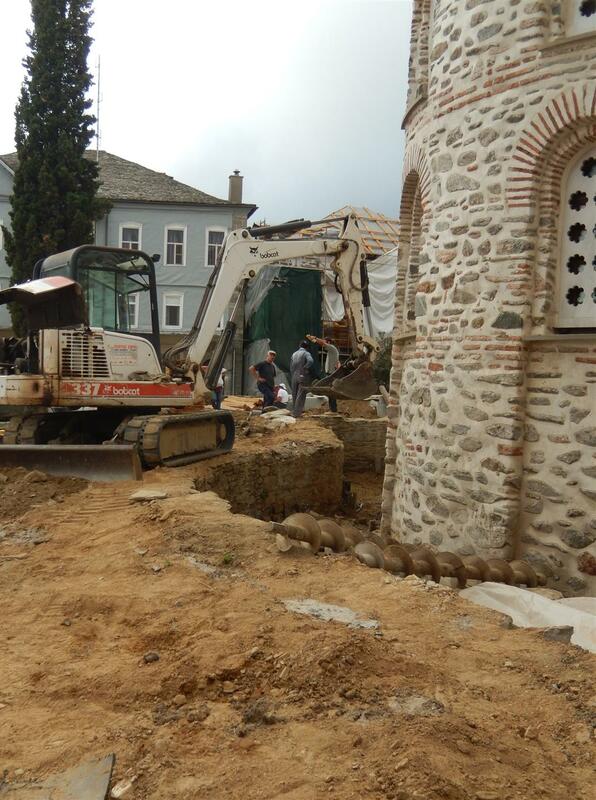 Indeed, lack of archeological survey at this occasion is more or less strange, because the Protaton must be a very old church, probably the oldest surviving one on Athos. Andreas Aghioritis (1969, opp. page 48) dates the Protaton from the 4th century. Maybe it is a lack of money or for religious reasons the authorities forbid further digging. 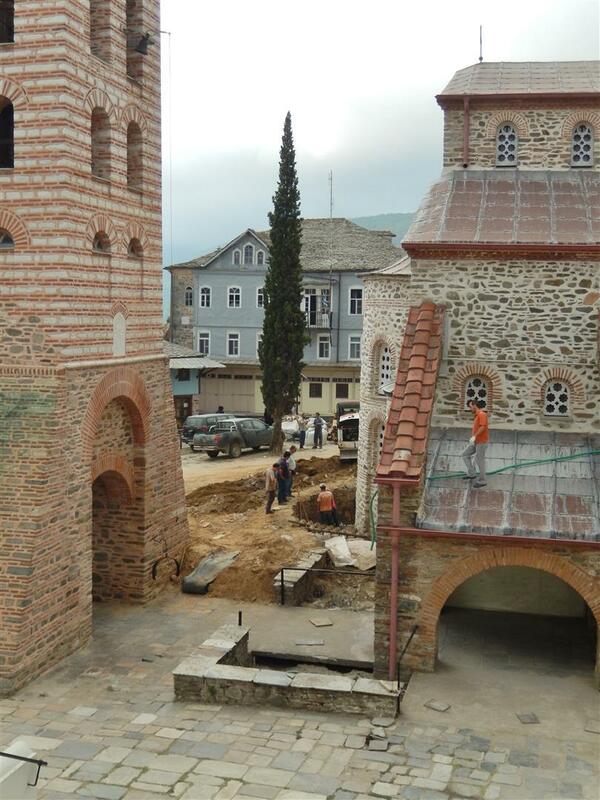 I was on Athos in late September – and I’m also an archaeologist. The lack of overt archaeological work during the current restoration work at the Protaton isn’t necessarily a surprise as archaeological survey has taken place in the past. 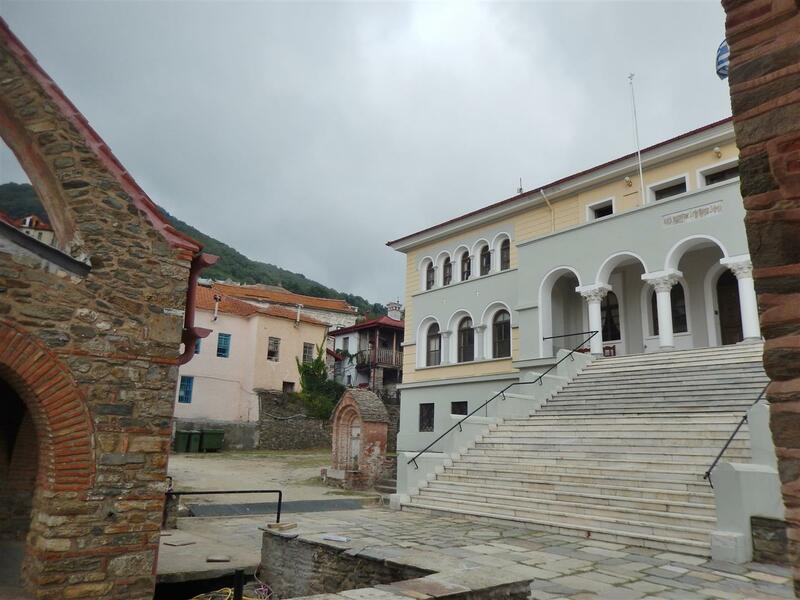 For example, the Aristotle University of Thessaloniki has previously undertaken a non-intrusive geophysical survey of the exterior and interior – see “Geophysical exploration in the Church of Protaton at Karyes of Mount Athos (Holy Mountain) in northern Greece” in Archaeological Prospection 14(2): 75-86 . For what it’s worth, I found that several monks were interested in archaeology; while I never raised the subject myself, monks at both Gregoriou and Iviron asked me for my opinion of the ongoing major excavation at Amphipolis when they found out what I do for a living. I have been following the excavations in Amphipolis on the internet and was really impressed by the results until now. I wonder what future digs will bring, exciting work you have!